More than 90 percent of the ingredients that go into our sandwiches, salads and other deli options are organic, and 100 percent meet our strict standards for quality. Whether you’re stopping in for breakfast, lunch or dinner, every creation is made from scratch, including our sauces and dressings. You’ll always find healthy choices for all types of eaters and plenty of plant-based meals using the freshest ingredients from local farmers and suppliers. 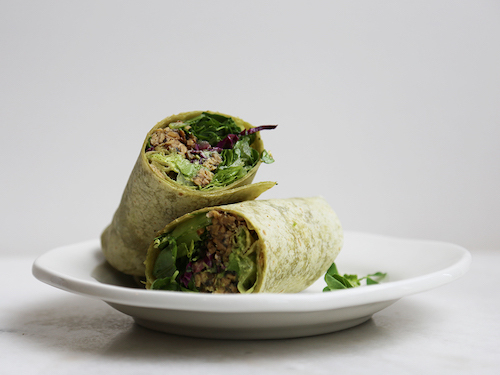 Tempeh Wrap: If you’ve tried tempeh and weren’t a fan, give it one more chance with our wrap! Creamy avocado, crunchy pea sprouts, pickled red onions and a sweet teriyaki glaze will make you a believer in plant-based sandwiches. Beyond Meat Burger: A smoky/sweet secret sauce tops our version of this all-American, plant-based classic. Street-style Tacos: Made with just-caught local Mayport shrimp, or our house-made blackened chicken or spice-roasted cauliflower, and topped with our own Southwest ranch. Ultra-fresh and tangy, with just a touch of heat. Baja Salad: We unwrap the street-style taco ingredients for a flavorful twist on the usual salad options. Grilled Chicken Sandwich: Find out how much flavor can be packed into one sandwich! Red wine vinaigrette-marinated chicken with rosemary is topped with Balsamic Onion Jam, arugula and Dijon for the ultimate savory meal. We update our deli menus regularly, so be sure to check our menus for the very latest. Order ahead or have it delivered. Save time, no lines—order ahead online for pickup in-store and we’ll have it ready when you arrive. Select your location and place your order with just a few clicks. Rather have the deli come to you? We’ll have your Personal Shopper from Instacart bring prepared soups, salads, fresh dips, and more grab-and-go items to your door with our online grocery delivery service.